13th October, 2006. In this issue: New Products - range of new children’s books, Super Special and a New Article - Camping Lights. Did you know it's only just over 10 weeks until Christmas? With this in mind we are happy to bring you a range of new children’s books which could be handy to fill those stockings with! Ranging from the old favourites that we used to read when we were younger to some new titles just released. There is quite a selection and books are suitable for all age groups. Super Special - Only 2 available so be quick! In this article we list and describe the diverse range of lights available today and the options you might consider before embarking on your camping trip. There is a comprehensive explanation of the technologies of electric powered lights and various fuel systems for lanterns. 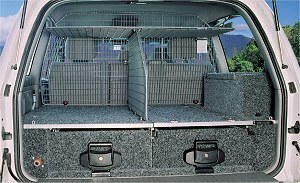 This quality powder coated steel mesh product is designed to further increase the storage capacity of an Outback Roller Drawer equipped vehicle. Combined with an Outback Cargo Barrier, the rack also adds further safety and practicality for fully laden vehicles. Especially where a fridge is fitted, it allows other cargo to be safely carried adjacent to the fridge and above, without closing off the necessary ventilation space. Note the purpose designed mesh and bar clamps moulded in reinforced nylon. These are exclusive to this product and demonstrate our commitment to the highest standards of design and finest manufacturing methods and materials. Available to suit: 2003- Prado, 100, 80 Series Landcruiser and Nissan GU Station Wagon. Priced at $537 Retail. Part Numbers are: 100/RRD: suits 100 & 80 Series Landcruiser and Nissan GU Station Wagons PRO3/RRD: suits 2003- current; Prado Station Wagon.